The Equator P2 is a hybrid amphibious two-seater that looks like the future. Under development for a decade, this amateur-built machine looks highly professional, surpassing in form and function many of its factory-built peers. It had its first motor run-up recently, a much-anticipated event that met all expectations. One can see the garage-built home of the craft in the simple bracing used to hold the tail-mounted motor in place, an example of the truly hand-made nature of the Equator prototype. The rudimentary surroundings fail to show the sophistication of the design, however, including a power system similar to that used on the range-extended e-Genius. Progress over the last nine years has been limited, as with many such projects, by (in Tine Tomazic’s words)”the speed of cash.” As with other such projects, the family car occupies the driveway, the Equator the garage. Tomas Brodreskift designed the craft while serving an internship with Airbus. He spent spare moments visiting Guenter Poeschel, designer and builder of three large Equator aircraft, including one amphibian with its engine mounted on a tall mast. The other two craft featured an engine on a nacelle protruding from the leading edge of the vertical fin. In that time, Tomas has used his industrial design skills to create a roomy cabin, expandable two-plus-two capacity, with pilot and passenger under a clear dome and facing a simple glass cockpit and controlling things through a fly-by-wire system with no rudder pedals, all coordination being taken care of by software. 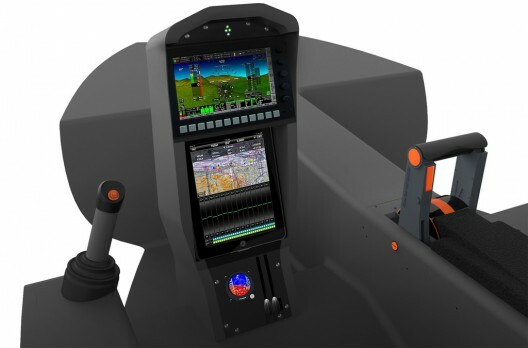 Pilots will find a lower workload with a single control lever managing a complex network of Diesel generator, batteries, motor controller and motor to create thrust from the tail-mounted propeller. It is similar to the range extender package recently tested on e-Genius. The video shows progress up to the airplane’s debut at AirVenture 2013, and highlights the range of skills required to create such a craft. Following a long development and construction period, the Equator P2 may be on the verge of full-systems testing and initial flights. We look forward to new developments from this dedicated designer and his team.